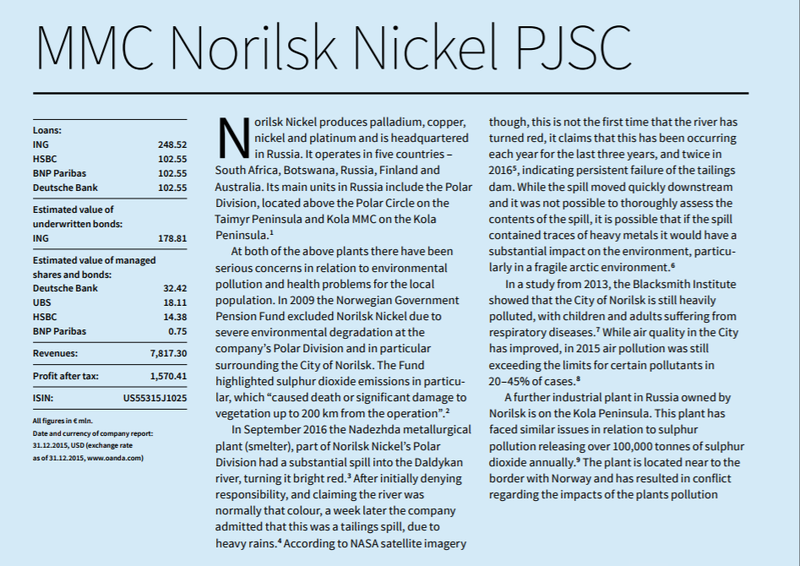 Norilsk Nickel, as reported in our previous Dirty Profits 5 report 1, has had serious concerns in relation to environmental pollution and health problems for the local population. In 2009, the Norwegian Government Pension Fund excluded Norilsk Nickel due to severe environmental degradation at the company’s Polar Division and in particular surrounding the City of Norilsk. The Fund highlighted sulphur dioxide emissions in particular, which “caused death or significant damage to vegetation up to 200 km from the operation”. The fund continues to stand by this assessment and Norilsk remains excluded. In addition, in September 2016 the Nadezhda metallurgical plant (smelter), part of Norilsk Nickel’s Polar Division had a substantial spill into the Daldykan river, turning it bright red. After initially denying responsibility, and claiming the river was normally that colour, the company admitted a week later that this was a tailings spill, due to heavy rains. Smelters belonging to Norilsk have also been pumping out air pollutants including sulphur, harming residents particularly those in the polar city of Norilsk. The company has done little to improve its environmental performance, although a small step was joining the UN Global Compact in November 2016. It has also claimed it will reduce its sulphur emissions and has hired SNC Lavelin to help to progress this. However, this pales in comparison to the substantial negative impacts of their operations. The banks involved in the financing include HSBC as mandated lead arranger, Unicredit Bank AG as facilitator, and ING as coordinator, among others 2. The proceeds will be used for refinancing of the existing debt, financing of capital expenditures and general corporate purposes. In light of the serious environmental concerns around Norilsk Nickel’s operations, banks cannot agree to provide such substantial funds without additionally requiring the company to improve its environmental performance. The company has been operating with impunity for decades damaging people’s health and the environment. Norilsk Nickel has also been ranked incredibly poorly in the 2017 Corporate Human Rights Benchmark of Extractive Companies, scoring a meagre 25% 3. According to the OHCHR, “The UNGPs apply to all business enterprises, including commercial banks and other entities in the financial sector, regardless of “size, sector, operational context, ownership and structure”. Equally, they apply to any company or commercial vehicle from any other sector that may be a client of, or enter into a business relationship with, a bank.” 4As previously stated in the Dirty Profits 5 , banks should rescind funding for companies with poor environmental and human rights performance, including Norilsk Nickel. Posted in Harmful Cases, uncategorized, News & Media. | Tagged Banks, environmental pollution, Norilsk.